Stitcher's Supplier could help you get things into the graveyard. You may also want to look at Creeping Chill and Narcomoeba as bonus things to mill over. Stitcher's Supplier , since he is a zombie and fills in graveyard twice for Lili? 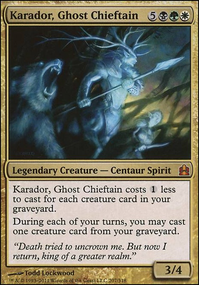 I guess Stitcher's Supplier gets better when you have Grim Haruspex , Grim Haruspex , and Harvester of Souls . What I’m more surprised by is Mindblade Render . Does it really get through often enough to get the draw? If you land it T2, sure, but it doesn’t seem like a great topdeck later. Sloanan on "Grimgrin Want to Play!" Happy to help! Fair enough on Empty the Pits . 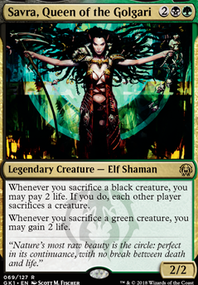 I'm somewhat partial to Enhanced Surveillance from the last Ravnica set, but that's also a permanent so it'll be pretty televised (though that by itself is a solid deterrent). There's also Crypt Incursion if you're looking for some instant speed shenanigans. Not great but I played it one time in an older build and went from like ten to 40ish for only three mana. As far as your land count, I think reducing the overall average CMC of the deck will be fine. You can work with 35 (I've got more than my fair share of decks with that many lands), but I wouldn't lean too heavily into anything above 5 CMC if you do so. Otherwise I'd add least one land (though another bit of artifact ramp oughtta do the trick as well). For enablers for Grimgrin, I'm somewhat fond of Faces of the Past , as it doesn't just untap Grimgrin but also any other zombie that you attacked with. Midnight Reaper gets you some card draw if you're saccing nontokens. Dreadhorde Invasion will give you sac fodder AND some nice lifegain when it releases with War of the Spark. If you're going with a self-mill style, Stitcher's Supplier isn't a bad choice. 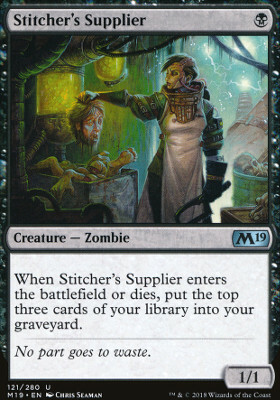 Stitcher's Supplier seems reasonable at first - a sac'able zombie that generates "card advantage" for a very minimal cost. Having tested Liliana, Untouched By Death in many games, I've found that the "card advantage" supplied by putting the top-3 into the yard - more often than not I'd have milled into 3 non-recursive combo pieces - no joke out of ten attempts - the first activation hit Phyrexian Altar in eight games. If you have genuine success & good vibes about the zomboi, let me know. I'm a little more comfortable with trying out Grim Tutor . Good to see you're going for crypt of agadeem - it puts in overtime with Deserted Temple . Bunch of cuts, bunch of additions! 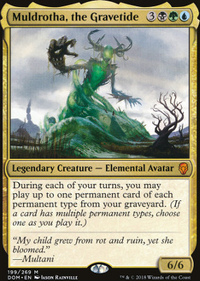 Notably, Meteor Golem gives us a not-completely-embarrassing out to Stony Silence/Null Rod effects, which otherwise shut down Phyrexian Altar , treasure tokens from Pitiless Plunderer , and Walking Ballista (in other words, all of our win conditions) as well as Rest in Peace and Leyline of the Void , meaning the stupid Rings/Monolith combo is no longer relevant! Main theme of many of the changes is maxing out on redundant effects for recursive creatures and interchangeable pieces for the end win condition, as well as the full suite of 'draw cards on death' triggers to go with our recursive dorks. Replaced the one-shot card draw like Night's Whisper with more engines. Particularly nice if you have Walking Ballista + Mikaeus, the Unhallowed with no sac outlet (Ballista can kill itself repeatedly to draw into an unrestricted sac outlet) or Gravecrawler + Phyrexian Altar / Pitiless Plunderer + sac outlet without a source of extra bodies or mana. Pitiless Plunderer -- Excellent addition, reanimate-able Altar as long as you have a sac outlet on board. Can even stockpile Treasures for burst turns or casting fat. 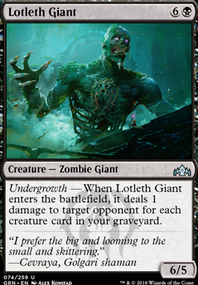 Diregraf Colossus -- Not super useful on its own, but it does serve fairly cleanly as a castable/reanimate-able Bridge from Below while also being a Zombie for Gravecrawler. Major downside is that it does absolutely nothing with Nether Spirit or any other card combinations, so I'm on the fence but excited to give it a shot. Priest of Forgotten Gods -- Came in to accompany the greater focus on recursive dorks and death draw triggers. Very, very good with Pawn of Ulamog/Diregraf Colossus tokens. Stitcher's Supplier -- Little dude does SO MUCH WORK. Liliana -1 to bring him back is a fairly common play, and often very strong. It's even a zombie! Songs of the Damned -- I was worried this would be dead too often, but it's crazy explosive, and I'm tempted to try Crypt of Agadeem . As soon as War of the Spark is released, Liliana's Triumph is slotting RIGHT in; card is nuts.